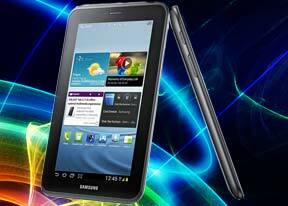 The Samsung Galaxy Tab 2 7.0 is shipping with Android 4.0.3 Ice Cream Sandwich. As usual it is skinned with the proprietary TouchWiz UI, which adds more customizations to the interface than its Honeycomb counterpart. The typical Android navigation keys are in the bottom left corner of the homescreen: Back, Home and Task switcher (plus a screenshot key courtesy of TouchWiz). The search shortcut is in the top left, the app drawer in the top right and finally, the notification area with quick toggles in the lower right corner. The pinch gesture familiar from TouchWiz phones lets you add, delete and rearrange homescreens easily. The same pinch gesture can be used in the app drawer to again let you rearrange pages. You can't delete or add new pages this way though. The taskbar at the bottom has an arrow that flips up a row of what Samsung calls Mini Apps. The Galaxy Tab 10.1 had them too, so they're not new, but they're still fairly unique in the Android world. Mini Apps are small, independent windows that always overlay everything else - homescreens, regular full-screen apps, anything. You can fit two or three of those on the large 10.1" screen and they really improve the multitasking abilities of the tablet. Available Mini Apps include a dialer, messaging, email, calculator, music player, S Memo, even a task manager. If you're not using some of those apps, you can always choose to hide them. Each Mini App has a button in the top left that launches the corresponding full-featured app and a close button in the top right. Such overlaid windows have been a staple of desktop OSes, but they feel a little odd in Android at first. The notification area has the connectivity toggles that we've come to know from the smartphone edition of TouchWiz. They offer more functionality than the stock ICS quick settings - including GPS, Wi-Fi and Bluetooth controls - which saves you the extra effort of entering the extended settings menu. The rest of the toggles are Notifications, Sound, Auto-rotation and Flight mode. The search shortcuts (voice and text) are in the top left corner of the homescreen, while the app drawer button stays in the top right. The Samsung Galaxy Tab 2 7.0 comes with plenty of preinstalled apps that cannot be found on other tablets - Social Hub, Music hub, Pulse reader, AllShare, Polaris Office, Video player and My files. Some of the other apps like the music player and the calendar have been modified as well. We ran the traditional Android benchmarks on the Galaxy Tab 2 7.0 (powered by the TI OMAP 4430 SoC, featuring a 1GHz dual-core Cortex-A9 and a PowerVR SGX540 GPU). The processing power is hardly the best around, but is more than decent for the price range. As expected, the Samsung Galaxy Tab 2 7.0 comes with about the same CPU performance as the other Galaxy Tabs we've tested recently, but the PowerVR SGX540 GPU is less-capable than the Mali-400MP in the Exynos chipset. It holds its ground quite well against the ULP Nvdia GeForce inside the Tegra 3, though. As you can see, there's not much difference in terms of pure performance between the slates running Android Honeycomb and the ICS-packing Tab 2 7.0. However, that's just more proof that benchmarks can, at times, be misleading as the overall UI experience is a lot faster here.